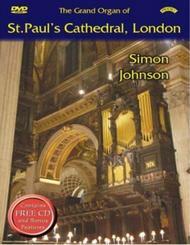 This new DVD and CD from Priory is the fifth in a series of organ recitals filmed in Britain’s great cathedrals. The programme is designed around the history of the building, and contains in particular a poignant reminder of the blitz in 1940, with the music of Samuel Barber’s Adagio. Filmed beside the new nave console, this is also the first recording since the instrument’s restoration. Also seen are numerous pictures from inside and outside the Cathedral, including the crypt and the whispering gallery, together with illustrations of the Great Fire of London. The music has been specially chosen to provide links with organists connected with St Paul’s, including Maurice Greene, Hubert Parry, Felix Mendelssohn and George Frideric Handel. Jeremiah Clarke’s famous Trumpet Voluntary was recorded to show off the west end royal trumpets (and for hi-fi buffs listening in 5.1 surround sound, these will be heard only from the rear speakers). This we believe is Priory’s greatest DVD to date in terms of technical brilliance and recorded sound – every available trumpet and tuba combination has been demonstrated by Simon Johnson in this recital, and his visual ‘talk-through’ of Norman Cocker’s ‘Tuba Tune’ on one of the bonus features is fascinating both for students and general listeners alike. The programme chosen demonstrates the entire organ and the visuals feature the great building in its entirety. The bonus tracks also contain a full demonstration of the restored organ from the mobile console, including shots probably never seen before of the interior of the organ and the tuner at work, plus much, much more. As usual we include a free CD for in car listening or state of the art sound.